This month, the spotlight is on Marguerite Khirigian of ShaverWorld (Groupe CDREM) as she illustrates how ReplyManager helped her and her team stay on top of emails and survive the craziness of holiday shopping. She is the second feature to our Customer Stories campaign, which is designed to showcase how other online sellers use ReplyManager. "RM helped us get through the craziness of holiday shopping - it saved us so much time!" 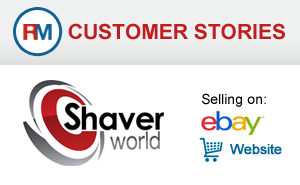 Groupe CDREM (ShaverWorld) is a retailer in personal care and grooming products (shavers, epilators, hairdryers, flat irons) as well as coffee machines, small kitchen and household appliances with over 500 listings on eBay and ShaverWorld sites. "We began by 'testing' it [ReplyManager] to see how much it would help. Low and behold, we're now convinced customers! We have now consolidated 10 different email accounts and manage them so much more efficiently which in turn helps us manage our business growth and improve our customer service skills." We would love to hear from you! Send an email to stories@replymanager.com. Tell us how ReplyManager helped improve your business and what advice you would give to other online sellers. You should also include a quick paragraph about your company, your name, website URL and a snazzy photograph of yourself.